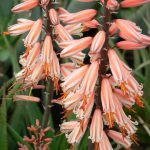 Medium-sized, stemmed aloes are few and far between, and this is one of them. The blood red flowers are complemented by shortish green leaves. A unique feature of this cultivar that is the racemes are carried at a near horizontal angle. These are borne by multiple inflorescences in late winter. The plant itself may divide its rosette as it matures, but stem shoots are very rare. 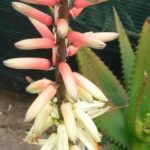 Even the divided rosette does not take up a lot of space which makes it a rather versatile plant around the middle of the open rockery where its flower style adds pleasing variety to the usually upright aloe flowers. 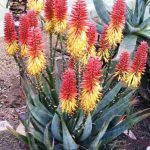 Its best companion for the rockery would probably be ‘Sun King’ (for its yellow flowers), although the red of ‘Angled Red’ combines equally well with the tall orange racemes of ‘Giza’. 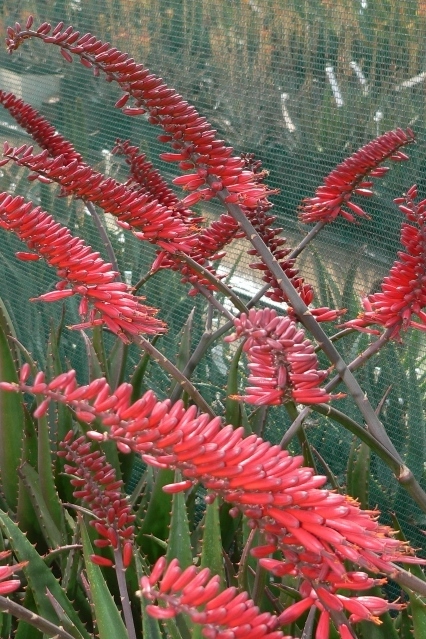 For gardeners who like red-flowered aloes this is an absolute must.